Chill the Nutella: line a baking sheet with parchment. 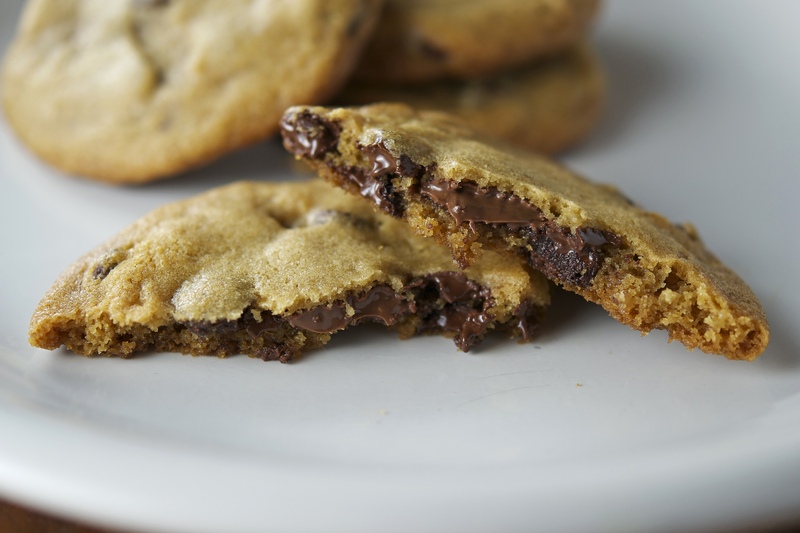 Place 3/4 cup Nutella into a sandwich bag – snip off the corner, and pipe teaspoon-sized circles onto the parchment. Set the pan into the freezer while you prepare the dough. Prepare the dough: Whisk together the flour, baking soda, and salt in a bowl and set aside. Place the butter into a medium saucepan, and melt over medium heat. Once the butter starts to foam, start to whisk consistently. After a couple of minutes, the butter will begin to brown on the bottom of the saucepan and give off a nutty aroma. Give it a moment, then immediately transfer the butter to a glass bowl to prevent burning. Set aside to cool for a few minutes. With an electric mixer, mix the butter and sugars until thoroughly blended. Beat in the egg, yolk, vanilla, and milk until combined. Slowly the dry ingredients slowly and beat on low-speed just until combined. Gently fold in all of the chocolate chips. Set the batter into a glass bowl, covering with plastic wrap pressed against the actual dough – chill both the cookie dough and Nutella overnight. Bake the cookies: Preheat your oven to 350 degrees F. Once dough is chilled measure about 1 1/2 to 2 tablespoons of dough and roll into a ball. Flatten the dough ball very thinly using the palm of your hand. Place 1 chilled nutella “coin” into the middle and fold dough around it; gently roll into a ball — it doesn’t have to be perfectly rolled! Make sure that the nutella is fully covered by the dough, adding more if necessary. Place dough balls on cookie sheet, 2 inches apart and slightly flatten the tops with your hand. Bake the cookies 9-11 minutes or until the edges of the cookies begin to turn golden brown. They will look a bit underdone in the middle, but will continue to cook once out of the oven. Cool the cookies on the sheets at least 2 minutes. Remove the cooled cookies from the baking sheets after a few minutes and transfer to a wire rack to cool completely. Repeat with remaining dough. Cookies will keep for a few days, sealed at room temperature.